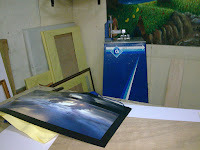 Framing is one technique by preserving our artwork and pictures.. it can also draw attention to our viewer to our favorite photos. (example: Framing A scene with an archway can tell something about the place or the beauty of the location..
2. Giving images a sense of depth & layers: generall puts something in the foreground which adds an extra dimensions to the view..
3. Leading the eyes of the viewer toward your focal point.